The return of Jimmy Liggins to the ranks of active artists with this release was cause for celebration and relief for all involved. Six months earlier Liggins had been shot in the face during an altercation at a club he was playing in Mississippi. Had the shots been an inch higher or lower he’d have died, but as it was the wounds he received were grisly enough even without considering the more dreadful alternatives. Of course for the 26 year old Liggins the fact he would live to see 27… and many more years after that… was the most important consideration, but when his jaw healed it was looking more and more as if he’d be able to continue his career. That wasn’t quite a sure thing yet, it’d be another seven months beyond this that he’d finally get back in the studio, but at least he was on the road to recovery by the fall of 1949. 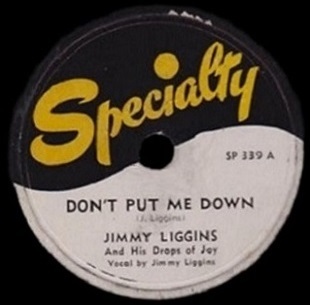 Specialty Records were happy too, not only because Jimmy Liggins was well liked by those at his label, but also because they were in the business of selling records and Jimmy Liggins sold records. Maybe if it had been someone from the Earl Simms Orchestra that nearly got his head blown off they might not have been so grateful to have him survive. Though Jimmy Liggins was Specialty’s first rock ‘n’ roller, and to date one of just a handful the company issued sides on, it wasn’t necessarily his pure rock releases that had the greatest commercial returns. This one included. Don’t Put Me Down became Liggins’ third national chart hit, yet none of them would be what you would call his most declarative statements as a rock artist. Like a lot of artists in rock’s earliest days he – or perhaps Specialty Records – were hedging their bets, pairing up a full-throttled rocker with something a little more “traditional” let’s say. That doesn’t mean something like this doesn’t fit under rock’s umbrella. Somber ballads have always had their place in the music, but it’s just that oftentimes you need to first prove your commitment to rock ‘n’ roll just to ensure these less frantic sides can be included. To put it another way, if this were the only song you had to judge what genre of music to slot Jimmy Liggins into, would it still be rock ‘n’ roll? I dunno… maybe. But if so it’s definitely not a sure thing. So that leads to the question of who specifically DID make this a hit if the most fervent in the rock audience might’ve been slow to latch on to it? Was Liggins splitting his appeal, giving the slightly older and less demanding listener something to whet their appetite while always making sure to stoke the fires of the younger crowd on the other side? It’s very likely, after all it’s good business sense. Around here we ‘re constantly preaching the value of offering two different sides to your musical persona… pair a ballad with an uptempo song, an instrumental with a vocal, if you’re in a group let somebody else sing lead for a change… anything to not grow stale and predictable. For Liggins whose fast-paced rockers all followed a similar melodic blueprint while he utilized the same vocal mannerisms on each one maybe it was just important that he downshift into something that didn’t sound like a carbon copy of his previous efforts. In that regard he was successful, for whenever he’s done so he HAS sounded different, proving that he was not a one-trick pony after all. The problem is, for those in the rock crowd we weren’t interested in pony rides, we wanted more horsepower than is shown here, making this a compromised listening experience if nothing else. One of the minefields we have to walk through quite often around these parts is trying to fairly evaluate records whose attributes aren’t the most seamless fit in rock ‘n’ roll. Though rock is certainly a broad musical genre with a lot of vastly different approaches, its depth and diversity a virtue not a drawback, that doesn’t mean all of those approaches are created equal. At a certain point the further away from rock’s core identity you get, or rather the closer to another genre’s borders you venture, the less vital that song becomes for advancing rock’s place in the world. We’ve seen this quite often with The Ravens who despite their success in pure rock kept trying to also score with pop-leaning songs. What we’ve reiterated with them time and time again is that should those pop records sell more than the rock sides, then there’s no longer a need for them to cut anything BUT pop, thereby removing them from the roll call of artists here, but also diminishing the entire scope of rock itself by wiping out one of the more creatively vital sounds we’ve encountered. For Jimmy Liggins perhaps the risk is even greater. True The Ravens were aiming for a much bigger outside market than Liggins was as pop, even black pop as defined by The Ink Spots and Billy Eckstine was far greater than the brand of “bandstand blues” motifs Liggins was constantly flirting with with half of his output, but it’s worth reminding you that of his songs which sold the most they all fell into that category best, not in rock ‘n’ roll and as such we didn’t even review Tear Drop Blues, his first hit, and were less than enthusiastic about his next charted record, Careful Love, owing to its somewhat compromised musical intent. Don’t Put Me Down is a different story even with its shared stylistic DNA. While it unquestionably leans in a bluesier old school direction on its surface it contains just enough rock attributes to qualify it here. Besides, if after all Liggins has been through of late, having another hole added to his mouth against his wishes, it’d be kind of heartless of us to fully deprive him of reviewing his biggest hit (#4 in Billboard during a nine week stay on the charts). Call us a soft touch for tragedy if you want, but from time to time it helps to look at the other avenues these artists could’ve taken, in this case you could even argue SHOULD’VE taken if going strictly by the commercial returns, and yet would nonetheless avoid committing to fully so that they could retain their membership in rock ‘n’ roll. If that’s not an endorsement for the intrinsic pull of rock music then I don’t know what is. Keep in mind, as on the flip-side, this song comes from an earlier recording session, though ironically a year later than the more advanced Nite Life Boogie we raved about on the other side. This was cut in November 1948 and while it’s even the slowest of his three bluesier hits the band subtly keeps this from sliding into that bag entirely. Don’t Put Me Down is built on a churning rhythm that is quite mesmerizing. Piano and horns combine to keep you locked in a groove, the horns slowly riffing while Bo Cyphers spry work on the keys off-set that and create a nice contrast that nevertheless works well together. Don’t overlook the light hypnotic brush work on the drums either, which although rudimentary in technique is incredibly effective in keeping you transfixed. Because its pacing is so deliberate it allows Liggins to relax vocally and take his time which alleviates his weaknesses to a great extent. He comes across as far more introspective than we’ve heard him before, not just due to his delivery but also some pretty fair lyrics as he attempts to convince his woman, still ostensibly with him it seems but wavering in her dedication, to stick around longer. We don’t know the circumstances that led to this, nor do we need to in this case. What we DO know is that the relationship is on the ropes and she’s the one holding his fate in her hands. You get the idea that there was no big blow up before this, no argument, no ultimatums, not even some moments of disgust over something he did. She just seems to have slowly lost interest when things didn’t progress, or didn’t retain the same heat they had when they first got together. It might’ve been six months or six years, but over time they’ve been gradually drifting apart. It’s doubtful that Liggins was completely unaware of this. He may have even been feeling less sparks between them as well, but the difference is to him the positives still outweigh the negatives and the idea of being with someone is a far better proposition than the idea of being alone and having to get back into the dating game and look for someone who, chances are, will wind up being no better than who he’s with now. For Jimmy this is a matter of practicality as much as anything. He may not even be fully invested in the case he’s making to her. He certainly doesn’t sound distraught, he’s not begging her to stay, but rather he’s calmly trying to convince her to give them another chance. But what makes this aspect so good is how subtly he’s manipulating her in the process, acting almost like a soothsayer even while he’s playing into his role as the subservient one of the couple. It’s those contrasting images he projects, fearful he’s about to lose her yet disarmingly confident he can win her over, which makes this so fascinating a character study. He’s admitting he holds no power over her to make her stay then exerts tremendous power of persuasion in HOW he says it. If you ask me, when he gets done with this masterful act she’s not leaving, at least not tonight. But as riveting the drama under the surface may be, there’s still the uneasy musical terrain this sits on which has to be taken into account. To reiterate a point made numerous times on this site, the standards being used to grade these records is one that takes into account their impact on rock as a whole. In other words are the songs advancing the rock narrative any, or – as is the case here – is it having no real effect on broadening rock’s horizons, or perhaps even being slightly counterproductive to its ultimate aim to provide something distinctly different than could be found elsewhere? That’s a hard question to answer truthfully. What this record offers is something that was unique for rock, but not exclusively confined to it. It was a malleable sound, something that’d fit in the repertoires of many different types of artists. But ultimately the fact that it IS coming from someone who was primarily a rock artist is what matters most. For while Don’t Put Me Down might be found on the bandstand being played by an uptown urban bluesman, or it conceivably could be spun on a jukebox by the same cats who were punching records by Herb Lance, or Jimmy’s brother Joe Liggins for that matter, the fact is it was written, sung and was a big hit for a guy who continued to release pure rock ‘n’ roll almost every time out. That counts for a lot. If buoyed by its success Jimmy Liggins decided to abandon rock and focus entirely on songs like this in the future then maybe we’d feel differently. Maybe then we’d be in the position Jimmy takes in the song’s lyrics – the ones trying to convince him to stick around in rock ‘n’ roll, urging him to reconsider and hoping that he’d have a lingering soft spot in his heart for our feelings towards him. But we don’t have to do that because he wasn’t in danger of leaving, he didn’t need convincing and hit or not, he wasn’t about to give up the more hard-charging songs that made him one of rock’s most promising artists just as it was getting off the ground. Maybe in the long run he would’ve been smarter to abandon us altogether, send us a postcard from the road if another style could’ve made him a bigger star, but he never wavered in his commitment and for that he should be rewarded. Leave a reply on "Jimmy Liggins: “Don’t Put Me Down”"